NEW YORK — A couple of games played during week two of the season had a major effect on the first College Football Playoff rankings. Georgia, Alabama, Notre Dame and Clemson were the top four teams in the selection committee’s initial top 25 released Tuesday night. Oklahoma, Ohio State and Penn State were next as the committee members let head-to-head results and strength of schedule be their guide. The final rankings that will determine the participants in the College Football Playoff semifinals come out Dec. 3. Georgia and Alabama, Southeastern Conference rivals, are both 8-0 and have been dominating their competition. The Bulldogs’ one close game was at Notre Dame in September, a 20-19 victory. Committee chairman Kirby Hocutt, the athletic director for Texas Tech, said the Bulldogs had a slight edge over the Crimson Tide because of their victory against the Irish on Sept. 9. The Fighting Irish (7-1) have not lost since, including blowouts of Michigan State (24th), Southern California (17th) and North Carolina State (20th). Those victories and the close loss to Georgia made the Irish the highest ranked among one-loss teams. “The teams ranked three through seven are very evenly matched,” Hocutt said. Hocutt said Clemson’s six victories against teams with winning records, including Virginia Tech (13th) and Auburn (14th), outweighed a loss on the road to a Syracuse team that is 4-4. That’s been a fairly consistent trend in the short history of the selection committee. The members tend not to get too caught up in the notion of a bad loss. Hocutt also said Clemson (7-1) playing the second half against Syracuse without injured quarterback Kelly Bryant was a factor for the committee. On the same night Georgia beat Notre Dame, Oklahoma (7-1) won 31-16 at Ohio State. “For the teams five through seven, their head-to-head results were very important to the committee,” Hocutt said. Ohio State (7-1) rallied to beat Penn State (7-1) last Saturday, 39-38. In the latest AP Top 25, Ohio State was No. 3, Penn State No. 7 and Oklahoma was No. 8. Those rankings had some Sooners wondering if the committee would do something similar. The rest of the top 10 was TCU at eight, followed by unbeatens Wisconsin and Miami. 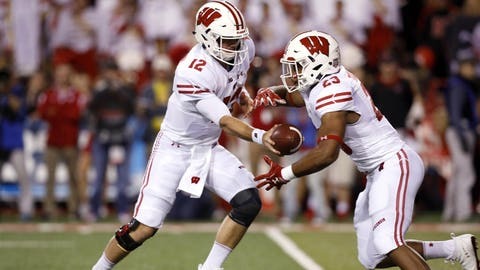 Hocutt pointed to strength of schedule as the problem for the Badgers, who were ranked fourth in the latest AP Top 25, and Hurricanes. The strongest team Wisconsin has defeated, Hocutt said, is Northwestern (5-3). Miami has only two victories against teams with winning records. Over the first three seasons of the playoff, a total of five teams have been ranked in the top four of the initial ranking and gone on to reach the semifinals: Florida State (which was second) in 2014; Clemson (first) and Alabama (fourth) in 2015; and Alabama (first) and Clemson (second) in 2016. When the playoff rankings come out, the phrase that gets thrown around a lot is: This thing will work itself out. The combination of contenders knocking each other off and a few upsets will make it relatively easy to identify the final four. This year, the thing might be more difficult to work out than before. The prospects for Georgia, Alabama and Notre Dame are tied together. Their success works in each other’s favor and they all seem to be very much in control of their paths to the playoff. The Bulldogs and Tide eventually could play in the SEC championship game. If both arrive 12-0 in Atlanta, and the independent Irish finish 11-1, the SEC championship could be for seeding and the Big Ten, Big 12, Atlantic Coast Conference and Pac-12 would be vying for one spot. Another point for possible chaos: The Big Ten and ACC both have the possibility of staging conference title games between two legitimate playoff contenders. The Big Ten could match Ohio State with one loss and Wisconsin with none. The ACC could have Clemson with one loss and unbeaten Miami — though unbeaten Miami would mean another loss for Notre Dame. The Big 12 has three possible one-loss champions (Oklahoma, TCU and No. 11 Oklahoma State), though OU still must play both. And the newly restored conference title game has to be a rematch. Meanwhile, in the Pac-12, it is pretty much Washington or bust, but the Huskies have a path to 12-1 that is just tough enough to build a solid case to be back in the playoff for a second straight season. There’s a lot of work to be done to work this thing out.